With it being in the low 80’s this weekend, it sure didn’t feel much like Fall to me since I’m used to the temperamental weather of Kentucky. That being said, it was the perfect weekend to spend outdoors. On Saturday afternoon, per the recommendation of one of my coworkers, Drew and I set off toward Ellijay to an apple orchard. Apparently, many people had the same idea (we found out later that the town’s AppleFest was going on as well). For us, this meant sitting in traffic for almost an hour, and battling the crowds once we got there. I loudly (and often) vented my frustration about the traffic. Poor Drew sat there like a champ and endured. He kept pointing out the good things, “It’s a beautiful sunny day,” “At least we’re moving,” etc. but I just refused to see the glass half-full. It had been my idea to go, and now I was afraid we wouldn’t be able to spend enough time there to make our trip worth it. We actually didn’t even reach our intended destination; the GPS seemed to think we’d reached Reece’s Apple Orchard when we were really at Burt’s Pumpkin Farm. Since Reece’s was apparently nowhere to be found, we decided to give it a go at Burt’s. After finally finding a parking spot and waiting in line for lunch, Drew and I settled in the shade under a beautiful tree. As we ate our BBQ nachos, fried apple pie and cider and people watched, I silently chided myself for being so impatient back in the car. We acknowledged that it wasn’t what we’d planned and we’d have to leave shortly after picking out pumpkins in order to make it back in time for our evening plans. Drew’s go-with-the-flow nature is something I truly admire about him, and something that I desperately wish I possessed. 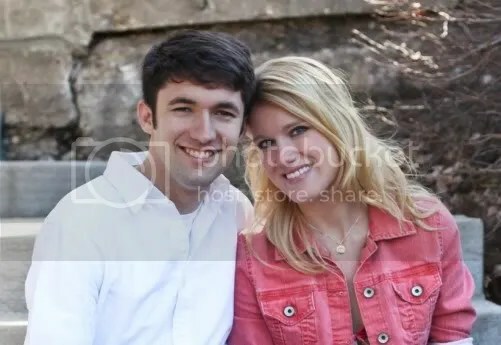 Again, I realized that marriage really is about teamwork and am thankful that Drew is such a great team player. We ended up having a wonderful time at the farm. After picking out two perfect pumpkins—we both like the short, fat kind best—we loaded them into a wheelbarrow and headed back to the car. The ride back home went much more smoothly; the only bumps we had were the pumpkins banging around in the backseat. The next day we headed to Canton for an early birthday celebration for C.R. 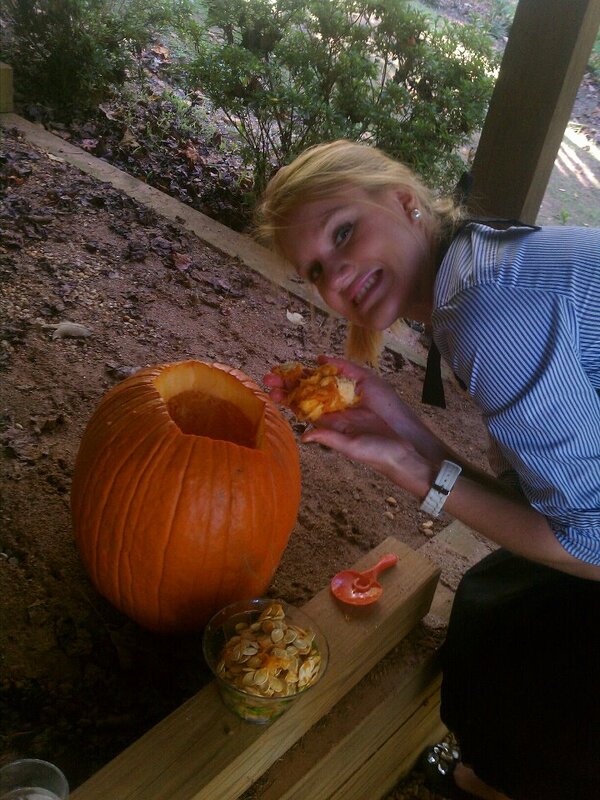 We brought the pumpkins with us and spent several hours in the backyard carving them. Again, the weather couldn’t have been more perfect. We saved the seeds to roast since Drew has never had them before. Not wanting to get our clothes messy before dinner, Drew and I wore our Mr. and Mrs. aprons, mine with pearls and lace, his with a rose boutonniere. 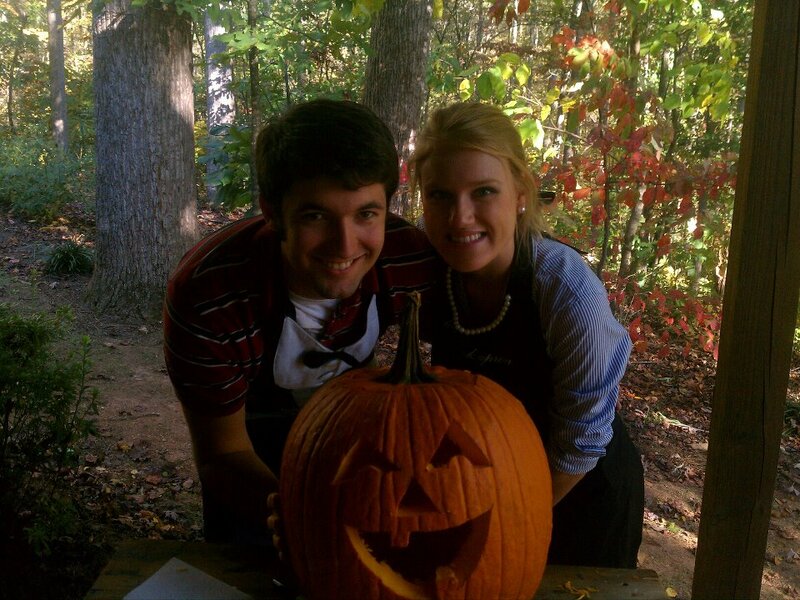 We’re a classy couple, even when handling pumpkin guts. 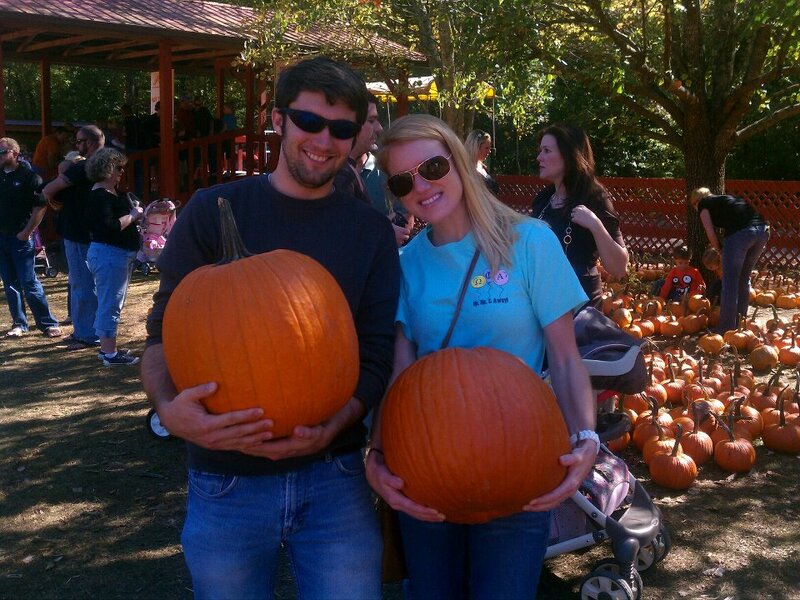 I’m so glad we got to spend the weekend outdoors, enjoying the pumpkin patch and spending time with Drew’s grandparents. I’m not sure how much longer the weather will stay warm, even in Atlanta. It was also the first time we’d carved pumpkins together and Halloween will be the first holiday we celebrate as a married couple. Our pumpkin, who we’ve named Herman, is sitting next to our couch in the living room. Every time I pass him, I get a whiff of that notorious pumpkin scent that just screams fall. And sure, he has a goofy, imperfect smile, but he’s full of memories of a very fun weekend!